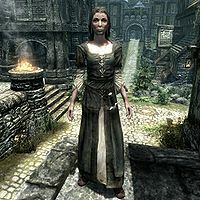 Evette San is a Nord food vendor who has a house and a market stall in Solitude. She deals in a variety of wines and other beverages. Her latest shipment of spiced wine has been halted by the East Empire Company and she needs someone to convince them to release it. She owns a house in Solitude, right across the street from Proudspire Manor, and sleeps there every night between midnight and 6am. After waking up she heads directly to the market stalls and spends fourteen hours offering her various beverages, including her trademark Spiced Wine, based on an old family recipe created by her father, infamous town drunk Octieve San. At 8pm she heads back to the house and spends the rest of the evening there, either eating, wandering or relaxing. There are two exceptions to her daily routine. When you arrive in Solitude for the first time, she will be amidst the crowd witnessing the execution of Roggvir. During the Burning of King Olaf Festival, near the conclusion of the quest Tending the Flames, she will sell her goods near the entrance to the Bards College and will even hand you a few bottles of spiced wine, as a reward for saving the festival. Selling her wine hasn't made her rich and her attire reflects that, a set of farm clothes and a pair of cheap boots. She wields an iron dagger and carries her house key, a spare belted tunic and a selection of lower-class items and gold. When she is at her stall, she will often try and attract customers by yelling: "Spiced Wine to warm the blood! ", "Keep the cold at bay with our spiced wine!" or "Spiced wine, the taste of home and hearth!" When you get near her, she will try to sell her produce even harder: "Spiced wine for ya? It's a family recipe." and "Wanderer like you needs a little fire in the veins. Some spiced wine?" Oddly, she will also say: "I swear, I left another bottle right here..." Lastly, she will warn you about her drunken father; "If you see my father Octieve around, stay clear. He'll only ask you for money or mead." As it turns out, Octieve San is the person responsible for the recipe on spiced wine: "Oh, yes. A secret family recipe. The only good thing my father Octieve ever did. In fact, it's so good, no one else in Skyrim even tries to make any." When finishing conversation, she will remark: "Good luck out there. It seems like a tough time to be wandering Skyrim." and "Stay warm and keep sober. It's the two things I know for sure will make life better." 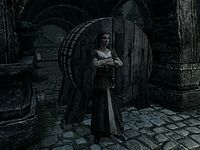 Her business very much depends on the annual Festival held by the Bards College, but since High King Torygg's death at the hands of Ulfric Stormcloak, and with the widowed Elisif the Fair declaring the Festival as 'poor taste', Evette sees no real future for her unique spiced wine. When asked about her business, before starting the quest Tending the Flames, she will explain: "They're... adequate. Honestly, I rely on the business brought in by the Burning of King Olaf, and that's not likely to happen this year." She will then proceed to explain why the Festival was canceled: "It's a great big festival put on by the bards, every year. They burn an effigy of old King Olaf. It's quite a bit of fun. The bards give out spiced wine during the festival, so they put in a big order. And then, for weeks after, demand is so high, I can barely keep up. But with the death of High King Torygg, the Festival has been declared "in poor taste." So it looks like it won't happen this year." However, once you save the Festival, Evette will be overly excited and can be found near the Bards College during the festivities, offering her spiced wine as always: "Spiced Wine here. First cup is paid for by the college." and "Get some Spiced Wine. A Festival Favorite." Not surprisingly, she will treat you with the utmost respect and hand you a few bottles with the words: "Just one bottle per customer. Except for the man who saved the festival. Here's a couple bottles for you." After the Festival, Evette will experience a rise in her sales, and will gladly tell you about them: "Oh, very brisk. When the snow sets in, even the hardiest Nord needs some spiced wine to warm the blood." In addition to her problems with the festival, Evette also faces huge problems with the East Empire Company as they have been holding back supplies. If you have yet to start the Dark Brotherhood quest Bound Until Death, Evette will greet you with: "You wouldn't have a few minutes to run down to the docks would you?" She will then elaborate: "I've got a shipment of Spices the East Empire Company is holding up. I need someone to convince them to release it." If you reject to help her, she will respond: "Ah well. I'll keep looking for someone. Thanks anyway." If you agree to run the errand, she will say: "Great. Get back to me when you're done and I'll give you something for your time." When you return from Vittoria Vici, Evette will be pleased to see her shipment released: "Thank you so much. I swear it's a fight with them every shipment. Here's something for your troubles." Aia: "You know, my father collected exotic alcohols." Aia: "Rum from Hammerfell, mulled wine from Daggerfall and the like." or "None of what he collected tasted as good as your Spiced Wine, Evette." or "I'm still finding your Spiced Wine to be the best drink I've ever tasted." Evette: "Thanks, Aia. That means a lot." or "Glad to hear it, Aia." Evette: "Spiced Wine for the Winking Skeever?" Sorex: "Actually just a bottle for me today. I'm thinking of giving it to Vivienne." Evette: "Sure, Sorex. Just like you did the last one." Sorex: "The last one was warm up." Silana: "Are your sales going well?" or "I hope the Divines have been keeping you well." Evette: "Not too bad. A few of the guests from the upcoming wedding have placed orders." or "They seem to when you're around Silana." Silana: "It should be quite the affair. Nice to have something happy in the midst of the war." or "Vittoria is practically glowing." Evette: "A bit of warming wine, Illdi. You know you can't resist." Illdi: "Not fair. You're well aware I can't seem to get warm here." or "Do you know I look forward to Burning of King Olaf each year just because of the fire?" Rorlund: "Ah a few bottles of Spiced Wine should hit the spot." Evette: "Of course. And I'm sure it's mostly for ceremonial purposes." Ataf: "I'll take a bottle of spiced wine." Evette: "I haven't known you to drink before, Ataf." or "A bottle of spiced wine for ya, Ataf?" Ataf: "Viarmo is trying to get Elisif to allow the Burning of King Olaf. I don't want to look like I don't know how to drink in front of the other bards." or "No thank you. I'm still feeling sick from the festival." Jawanan: "I think I may wait until the Burning of King Olaf to have and [sic] Spiced Wine." Evette: "You and everyone else. Word is it may not happen this year though." If you marry Octieve San, Evette will become your stepdaughter.